Religious truth is like troth, the experience of fidelity where one is affianced and then betrothed. What is true, then, is an experience of faith, and this is as true for agnostics and atheists as it is for theists. Those who cannot believe still require religious truth and a framework of ritual in which they can believe. At the core of Wilde’s remark is the seemingly contradictory idea of the faith of the faithless and the belief of unbelievers, a faith which does not give up on the idea of truth, but transfigures its meaning. 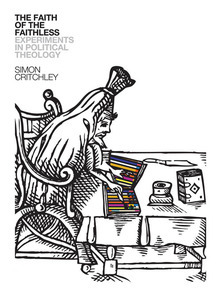 This post is excerpted from the Introduction of Simon Critchley’s new book, The Faith of the Faithless: Experiments in Political Theology, published by Verso. Responses to the book will be posted on Mondays for the next several weeks. I’d like to begin with a story, a parable of sorts. On May 19, 1897, Oscar Wilde was released from Reading Gaol after two years’ detention for acts of gross indecency. He left England for the last time on the same day and traveled to Dieppe. On his arrival in France, Wilde was met by Robert Ross, his loyal friend and sometime lover. Ross was handed a manuscript of some 50,000 words on eighty close-written pages. Wilde had apparently written it during the last months of his imprisonment: his gaolers allowed him one sheet of paper at a time and, after it was filled, took the completed sheet and handed him a new one. It was Wilde’s last prose work before his death in shambolic circumstances in Paris three years later, and the only piece that he wrote in prison. An expurgated version of Wilde’s text, a long and at times bitter epistle to his inconstant lover Lord Alfred Douglas, was published in 1905 with the title De Profundis, which is the incipit of Psalm 130 in Latin, “From the depths I cry to thee, O Lord.” It is the religious dimension of this letter that interests me, and in particular Wilde’s interpretation of the figure of Christ. I think that this text by Wilde illuminates extremely well the shape of the dilemma of politics and belief that will guide the various experiments in this book. De Profundis is the testimony of someone who knows that he has ruined himself and has squandered the most extraordinary artistic gifts. Yet the text is also marked by a quiet but steely audacity. Having lost everything (his children, his reputation, his money, his freedom), Wilde does not bow down before the external command of some transcendent deity. On the contrary, he sees his sufferings as the occasion for a “fresh mode of self- realization.” He adds, “That is all I am concerned with.” That is, Wilde’s self-ruination does not lead him to look outside the self for salvation, but more deeply within himself to find some new means of self-formation, of self-artistry. As he endures incarceration, Wilde seems to be more of an individualist than ever. As we will see, matters become more complicated still. For such an act of self-realization, Wilde insists, neither religion nor morality nor reason can help. This is because each of these faculties requires the invocation of some sort of external agency. Morality, for Wilde—the antinomian par excellence—is about the sanction of externally imposed law and must there- fore be rejected. Reason enables Wilde to see that the laws under which he was convicted and the system that imposed them are wrong and unjust. But, in order to grasp the nature of what has befallen him and to transcend it, Wilde cannot view his misfortunes rationally as the external imposition of an injustice. On the contrary, he must internalize the wrong—but this requires an artistic, not a rational, process. For Wilde, this means that every aspect of his life in prison—the plank bed, the loathsome food, the dreadful attire, the silence, the solitude and the shame—must be artistically transformed into what Wilde calls “a spiritual experience.” The various degradations of Wilde’s body must become “a spiritualizing of the soul,” the transfiguration of suffering into beauty, or what psychoanalysts call “sublimation”: passion transformed. When I think of religion at all, I feel as if I would like to found an order for those who cannot believe: the Confraternity of the Faithless, one might call it, where on an altar, on which no taper burned, a priest, in whose heart peace had no dwelling, might celebrate with unblessed bread and a chalice empty of wine. Everything to be true must become a religion. And agnosticism should have its ritual no less than faith. It is the phrase, “Everything to be true must become a religion” that is most striking. What might “true” mean? Wilde is clearly not alluding to the logical truth of propositions or the empirical truths of natural science. I think that he is using “true” in a manner close to its root meaning of “being true to,” an act of fidelity that is kept alive in the German word treu: loyal or faithful. This is perhaps its meaning in Jesus’s phrase when he said, “I am the way, the truth and the life” (John 14:6). Religious truth is like troth, the experience of fidelity where one is affianced and then betrothed. What is true, then, is an experience of faith, and this is as true for agnostics and atheists as it is for theists. Those who cannot believe still require religious truth and a framework of ritual in which they can believe. At the core of Wilde’s remark is the seemingly contradictory idea of the faith of the faithless and the belief of unbelievers, a faith which does not give up on the idea of truth, but transfigures its meaning. I think this idea of a faith of the faithless is helpful in addressing the dilemma of politics and belief. On the one hand, unbelievers still seem to require an experience of belief; on the other hand, this cannot—for reasons I will explore below—be the idea that belief has to be underpinned by a traditional conception of religion defined by an experience or maybe just a postulate of transcendent fullness, namely the God of metaphysics or what Heidegger calls “onto-theo-logy.” The political question—which will be my constant concern in the experiments that follow—is how such a faith of the faithless might be able to bind together a confraternity, a consorority or, to use Rousseau’s key term, an association. If political life is to arrest a slide into demotivated cynicism, then it would seem to require a motivating and authorizing faith which, while not reducible to a specific context, might be capable of forming solidarity in a locality, a site, a region—in Wilde’s case a prison cell. We appear to be facing a paradox. On the one hand, to be true everything must become a religion, otherwise belief lacks (literally) credibility or authority. Yet, on the other hand, we are and have to be the authors of that authority. The faith of the faithless must be a work of collective self-creation where I am the smithy of my own soul and where we must all become soul-smiths, as it were. The apparent paradox is resolved through Wilde’s interpretation of the figure of Christ. In his 1891 essay “The Soul of Man under Socialism,” Wilde describes Christ as a “beggar who has a marvelous soul,” a “leper whose soul is divine.” Christ is a “God realizing his perfection through pain.” Wilde’s captivity might, then, best be understood as an extended imitatio of Christ, where he becomes who he is through the experience of suffering. It is through suffering and suffering alone that one becomes the smithy of one’s soul. Wilde’s suffering in Reading Gaol is thus the condition for his self-realization as an artist. At the core of Wilde’s understanding of Christ is an almost Schopenhauerian metaphysics of suffering: “For the secret of life is suffering. It is what is hidden behind everything.”8 The truth of art, according to Wilde’s expressivist romantic aesthetics, is the incarnation of the inwardness of suffering in outward form, the expression of deep internality in externality. It is here that Wilde finds an intimate connection between the life of the artist and the life of Christ. To the artist, expression is the only mode under which he can conceive life at all. To him what is dumb is dead. But to Christ it was not so. With a width and wonder of imagination that fills one almost with awe, he took the entire world of the inarticulate, the voiceless world of pain, as his kingdom, and made of himself its external mouthpiece. In his compassion for the downtrodden and the poor, but equally in his pity for the hard, empty hedonism of the rich, Christ is the incarnation of love as an act of imagination, not reason, the imaginative projection of compassion onto all creatures. What Christ teaches is love, and, Wilde writes, “When you really want love you will find it waiting for you.”10 The decision to open oneself to love enables a possible receipt of grace over which one has no power and which one cannot decide. This Wilde Christianity finds its political expression in socialism. Wilde’s argument for socialism prior to his imprisonment is singular, to say the least. For him, the chief advantage of socialism is that it would relieve us of that “sordid necessity of living for others.” That is, socialism would relieve us of the constant presence and pressure of the poor: the bourgeois burdens of charity and the so-called altruistic virtues. In eliminating poverty at the level of the political organization of society, socialism “will lead to individualism.”16 That is, it will allow individuals to flourish in a society that will permit and positively encourage self-artistry and self-formation. But is such socialism possible without the experience of pain, suffering, and imprisonment, that is, without the whole imitatio of Christ that we have followed in De Profundis? In “The Soul of Man under Socialism,” Wilde imagines an Arnoldian Hellenism in which the sheer joy of life would replace painful lamentation for the suffering God. In 1897, after the experience of imprisonment and degradation, Wilde is not so sure. And this is what gives the lie to his aesthetic individualism. In my view, what is being articulated in De Profundis is not individualism at all but what, in my parlance, I call “dividualism.”17 The self shapes itself in relation to the experience of an overwhelming, infinite demand that divides it from itself—the sort of demand that Christ made in the Sermon on the Mount when he said: “Love your enemies, bless them that curse you, do good to them that hate you, and pray for them which despitefully use you, and persecute you” (Matt. 5:44). When Christ says this, when he makes this infinite ethical demand, he is not stating something that might be simply fulfilled or carried out. Whether he was the incarnation of God or just some troublesome rabbi in occupied Palestine, Christ was presumably not simply stupid and expressed this infinite demand for a purpose. When, in the same sermon, he says, “Be ye therefore perfect, even as your Father which is in heaven is perfect” (Matt.5:48), he does not imagine for a moment that such perfection is attainable—at least not in this life. Such perfection would require the equality of the human and the divine, a kind of mystical glorification. What such a demand does is to expose our imperfection and failure: we wrestle in solitude with the fact of the infinite demand and the constraints of the finite situation in which we find ourselves. Otherwise said, ethics is all about the experience of failure—but in failing something is learned, something is experienced from the depths, de profundis. What is exposed here—an idea I will return to throughout this book—is the nature of conscience, or what I will call that powerless power of being human. The infinite ethical demand allows us to become the subjects of which we are capable by dividing us from ourselves, by forcing us to live in accordance with an asymmetrical and unfulfillable demand—say the demand to be Christlike—while knowing that we are all too human. Although we can be free of the limiting externalism of conventional morality, established law, and the metaphysics of traditional religion, it seems that we will never be free of that “sordid necessity of living for others.” The latter requires an experience of faith, a faith of the faithless that is an openness to love, love as giving what one does not have and receiving that over which one has no power. It is the possible meaning of such faith that constitutes the horizon for this book. Is this not what Doestoevsky was getting in the Brothers Karamazov? Dmitri as the blessed sinner who desperatly wishes to be an angel like Alyosha but instead lives a rioutous human existance with a fusion of sin and saintlyhood? The Guardian piece suggests that Critchley’s notion of faith in an infinite demand leaves us rather more hopeless than hopeful.